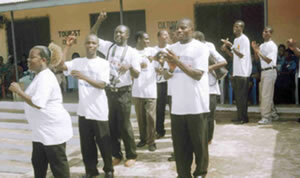 In July 2005, the first Africa HIV/AIDS Peer Education Training Program was held in Sierra Leone, Africa. There were 32 peer educators trained, as well as 4 Trainers of Peer Educators. In January 2006, the first HIV/AIDS Peer Education Training Program was launched at Larteh, Akuapem. We utilized the StarSpirit International, Inc. STARSPIRIT LIGHTHOUSE HIV/AIDS Peer Education Training Center, located on the main street of Larteh, as the training site. The program was highly successful and resulted in the graduation of thirty-two (32) Peer Educators-including 4 Trainers of peer educators. All HIV/AIDS peer educators who successfully completed the training received certificates of graduation from the programs two sponsors: StarSpirit International Inc. as an NGO, and the Research Group on Disparities in Health of Teachers College, Columbia University in New York City (ensuring scientific integrity of the program). Our first Larteh-based Peer Education Training Program for the prevention of HIV/AIDS enjoyed the support of the leadership of the people of Larteh, and our training program was kicked off with a brass brand and people of all ages carrying placards with HIV/AIDS prevention messages throughout the town-increasing awareness. The graduation ceremony at the conclusion of the 4 weeks of training was held in the main plaza with the Chiefs, Elders, community members, and school children present to enjoy just some of the 13 songs, 8 poems, 2 rap songs, and 8 theatrical skits the peer educators created to spread the word about how to prevent HIV/AIDS transmission. Thus, since February this year the peer educators and Trainers of peer educators have been busy spreading the word and increasing interest in AIDS prevention. They have gone to all 13 schools in Larteh and are eager to do much more. Our goal is to train many more cohorts of peer educators at the STARSPIRIT LIGHTHOUSE site. We plan to sponsor more HIV/AIDS Peer Education Training Program across Africa, the Caribbean, and across the Diaspora. To assist us in making our vision a reality, you can make donations to this project-helping us to stock the STARSPIRIT LIGHTHOUSE with the DVD/video equipment, computers, van, as well as stipends for peer educators, ensuring this program grows and is a success. Or, you can fund us to take a project to anywhere in our global community. Copyright © 2019 STARSPIRIT INTERNATIONAL INC.